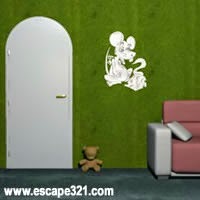 Sniffmouse Real World Escape 15 is point and click escape game by Demolacion for SniffMouse. You are trapped in a kid’s house. Noone will help you to escape. Someone has locked the exit doors(SniffMouse). Solve some puzzles in this house and get needed objects that will help you to escape from this house. Good Luck!